Spring Summer 2013 will be a summer with less colours. Black and white dominate runway, complementing with tough fighter-like silhouette and metallic armour. A new (or old) crinoline shaped body is up and rising. Print is getting thematic. In FW12, Marc Jacobs staged exaggerating outfits to recreate the small wait/ big bust female shape. 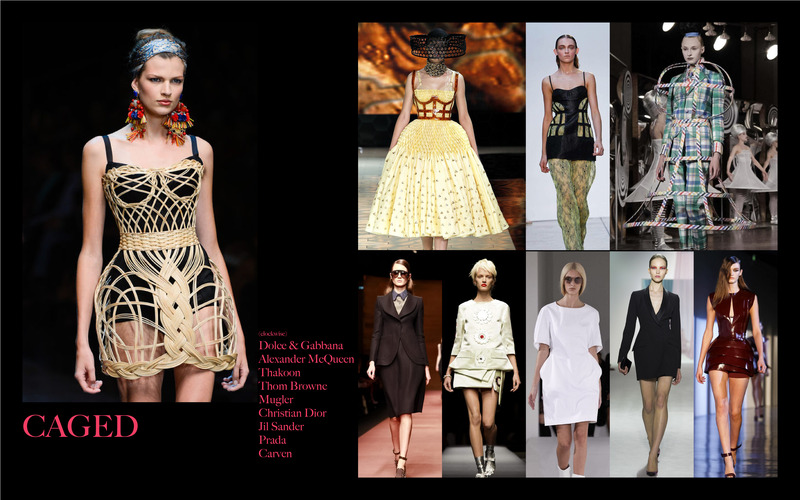 (See our FW2012 report here) As you can see in SS2013 shows, his influence is here to stay, and this time designers are explicitly playing with the key element of the shape: crinoline cage. Crinoline cage has been characterizing 18th and 19th century fashion history. Today in 2013 runway show, remarkable brands such as Alexander McQueen and Dolce & Gabbana re-constructed the cage in different materials like resin-plastic, palma straws or fabric itself. It may not be that wearable to layer your outfit with crinoline. So some minimalist brands like Prada, Dior and Jil Sander appropriated the trend and flirted with the shape in more obscure way. It is obvious that white has been a continuous color trend since last summer. In this season, white will return hand in hand with black like light and shadow, combining with strong and tough menswear like style. The key silhouette would definitely be squared shoulders armed look. In Etro, Damir Doma and Chloe, designers styled their warriors with extra contour belts. Women will be all armoured up in SS13. Rodarte, Pedro Laurenco and Altuzarra reimagined modern chest plate for highly stylized women in this battle. Silver yarns are weaved into the fabric to create metal-like surface. Chain mail is another armour option. Paco Rabanne combined metal beads, silver rings and hooks to form the chain mail gown that brings back the 17th century armor suit in the twisted-gender perspective. Gladiator sandals and boots are all over runway to complement the look. When we talk about colors we also refer to materials. It is the only way to cross the boundary of languages. Silver dusty surface, peacock feather metallic blue, polished plum pink etc, these are colors that came along with matters and probably also the easiest way to describe colors as a global language. 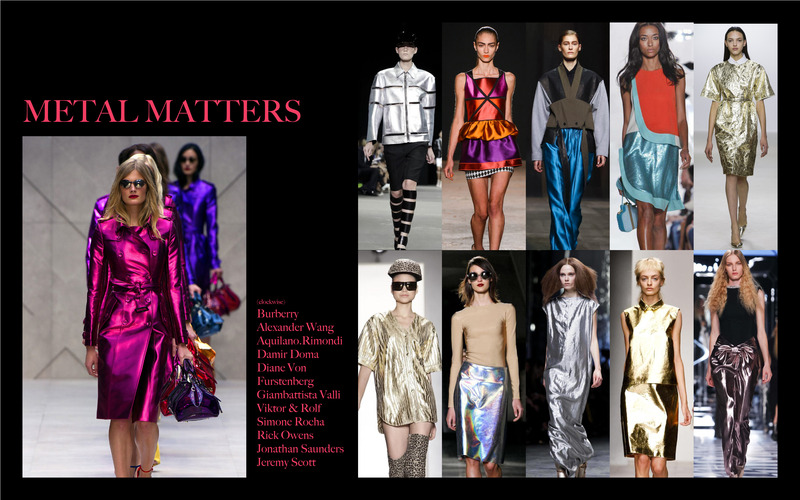 This metallic colour trend has gained strength since SS2012, spreading with more colour options. Burberry’s metallic rainbow parade is one of the highlights in this season. The rapid development of digital prints technology has allowed designer broadening their imagination in creating any pattern on fabrics. Today, you don’t even need any other techniques to give the illustration you want. 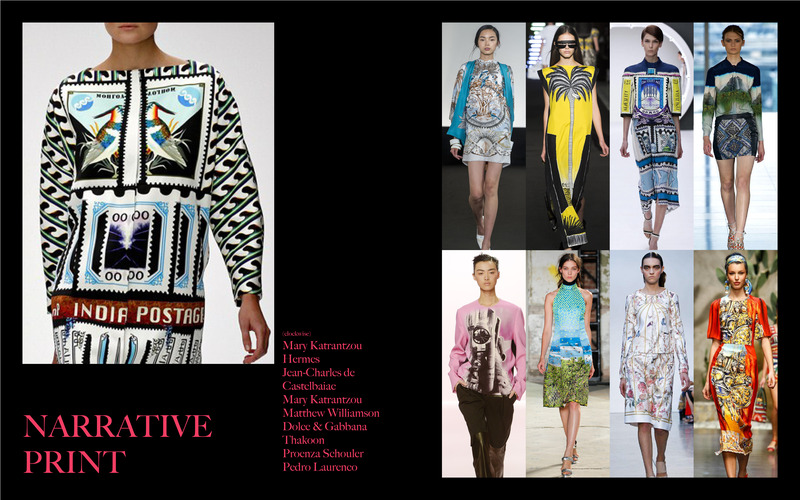 Digital prints can imitate woven graphic patterns, dyeing gradation, hand drawing, knitting pattern and more. It tells more stories with more precise details. In SS2013, various kinds of stories were being transferred to fabric: medieval fresco, surrealism painting, landscape drawing and mesmerizing postal print. All are telling their own stories and do more than attention-getting. Let’s be a little bit playful. These fringes make women look more attractive when they move. It can be fur, leather or metallic threads that go around you making your pathway like a dancing floor. It is another reinterpretation of fashion history. 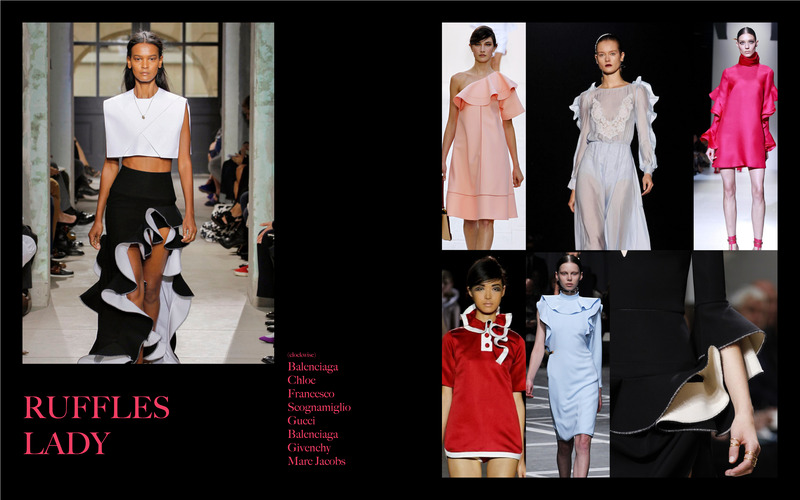 The 16th century flounce has been transformed into lady-minimal type mostly in plain color tone as you can see from Gucci, Givenchy and Chloe SS2013 runway.